Moldova – Christians under pressure for their faith. I was asked to do this feature on corruption in Moldova and how it is affecting Christians. 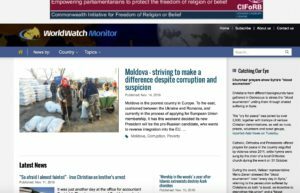 This was a branch-out for World Watch Monitor as they have never covered a story about Christians under pressure for their faith in the Republic of Moldova. Geographically, Moldova is also a little outside of their usual focus. I pitched this story to the editor as I have visited Moldova and was blown away about the apparent freedom, yet borderline bullying and red-tape that many people, Christians and non-Christians face in their pursuit to do anything good for the extremely poor people of Moldova. This article was published today against the backdrop of the Moldovan elections where it has now been confirmed that the pro-Russian candidate, Igor Dodon, has beaten all others to win the election. The names of the people in this article have been changed to protect their identities. If you’d like to contact me for any freelance writing work, please click here.